Riding Green River bike trails. Promotional photo by the Sweetwater Mountain Bike Association. Green River Wyoming today lures world class bicyclists with tempting mountain trails and spectacular scenery. But in 1868, the bicycle was the last thing on the minds of Green River citizens. 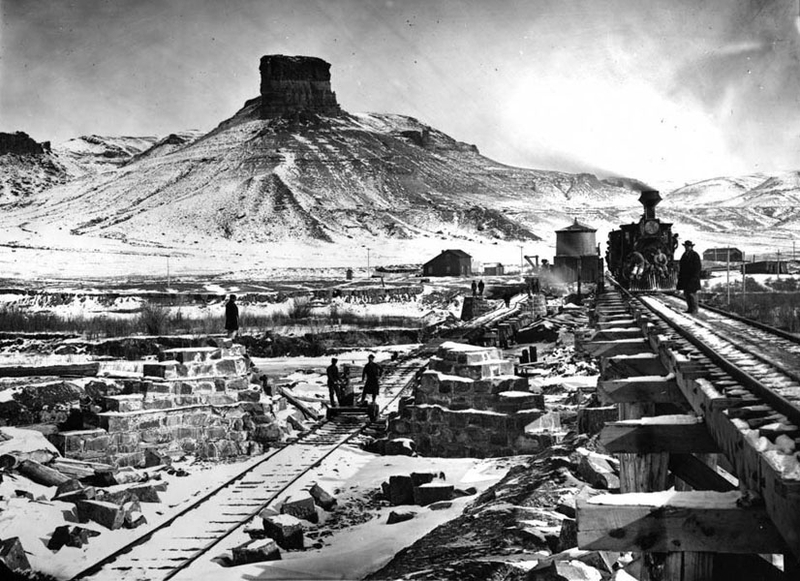 They were excited about the building of the transcontinental railroad, which would cross the Green River near the town of Green River, bringing potential prosperity. 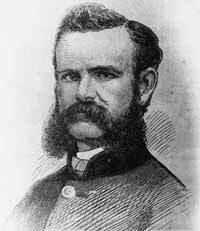 John Wesley Powell, the first person to explore the Colorado river from the Green River on the North to the Grand Canyon on the south. The building of the railroad across the Green River interested the explorer John Wesley Powell too, because he had a serious problem: it was his intention to be the first person to explore the Colorado River by boat. In Chicago, there was a builder of boats, Thomas Bagley, who understood how to construct wooden boats in the Whitehall design preferred by Powell. 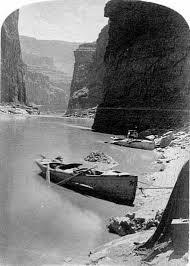 If these boats could be shipped from Chicago to Green River by the new railroad, Powell’s problem would be solved, because the Green River flows directly into the Colorado River. Every week railroad construction moved farther west. All Powell had to do was wait. Pretty soon, the railroad would lay 1,133 miles of track from Chicago to the Green River. 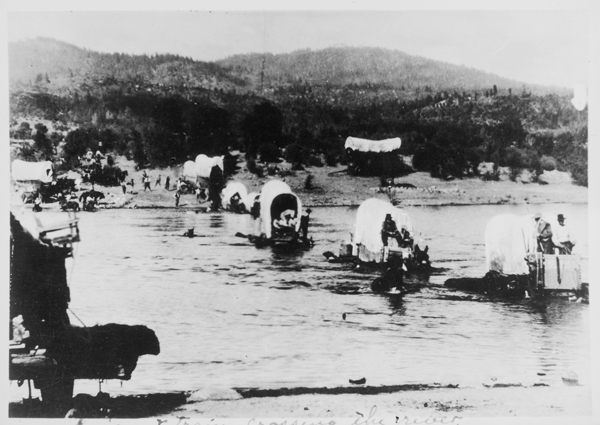 Wagon Train crossing a river, bringing emigrant families from the East to the New West. It is easy to forget how primitive life was in 1868. Only 20 years earlier, the California gold rush had prompted thousands of people to leave their homes and migrate west. They traveled in groups by wagon trains pulled by oxen, because it was the cheapest means of transportation west. They were still traveling in wagon trains in 1868. The new railroad would change that fast. Not everyone was happy about the railroad. Native Americans saw the tracks as a threat to their civilization. 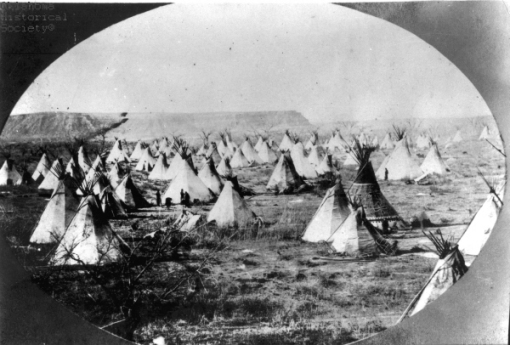 In 1868, Fort Fred Steel was constructed east of Rawlins for the specific purpose of protecting the railroad construction from angry Native Americans in the territory. Railroad Bridge over the Green River, under construction in 1868. Water for steam engines was at a premium. Near Rawlins, the railroad had a supply of water from the Platt River, but there was no water for the nearly 150 miles to Green River, so water had to be carried on the trains to supply the steam engines. Promontory Point, Utah, where the east and west railroad builders met. Green River was close to the end of the line for the Union Pacific Railroad. Only 240 more miles of track were needed heading west to reach Promontory Point in Utah, where they would meet the Central Pacific railroad, which was headed east. 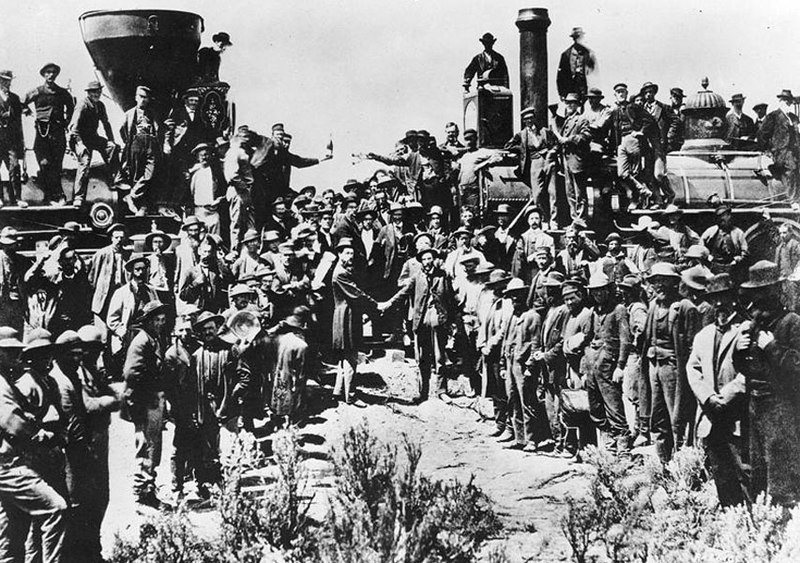 The two railroads met on May 9, 1869 and the famous Golden Spike was driven into the track, uniting the railroads for the first time. 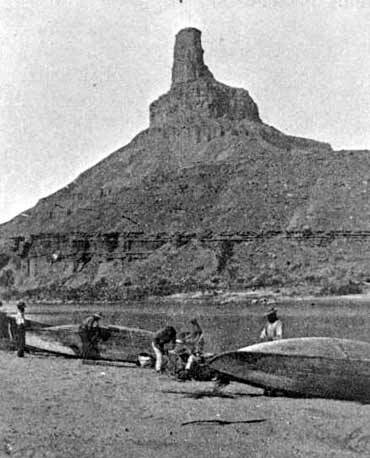 John Wesley Powell and exploration team launching Chicago boats into the Green River. 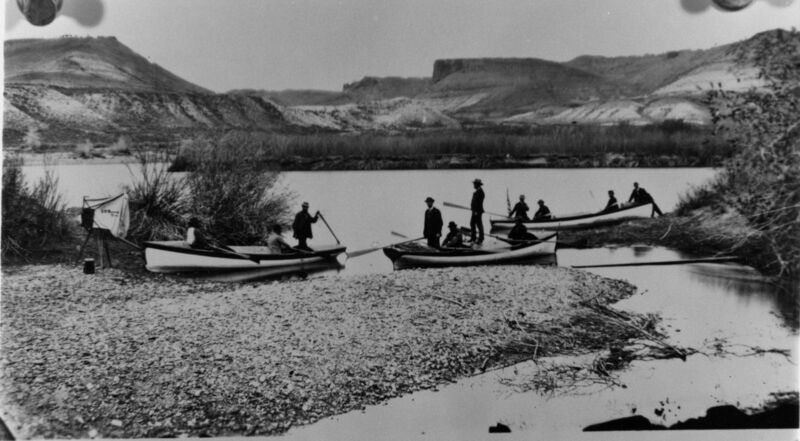 Only a few weeks later, on May 24, 1869, John Wesley Powell and a 10-man crew of explorers placed those boats created in Chicago into the Green River.And thus began their historic exploration South to the Colorado River. The railroad delivered the boats a no cost. It was probably the last thing the railroad did for free. Whithall design boat beached on the Colorado. Powell Colorado Expedition at Gunnison Butte. Green River Bike Park trail in promotional photo by the Sweetwater Bike Association. As you might imagine, the citizens of Green River are rightfully proud that their community is etched in the history of railroading and the history of American Exploration. But that was then and this is now. 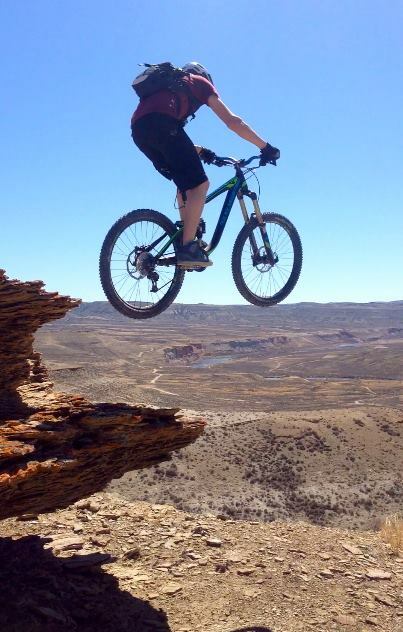 Today Green River is well known for exciting mountain biking. 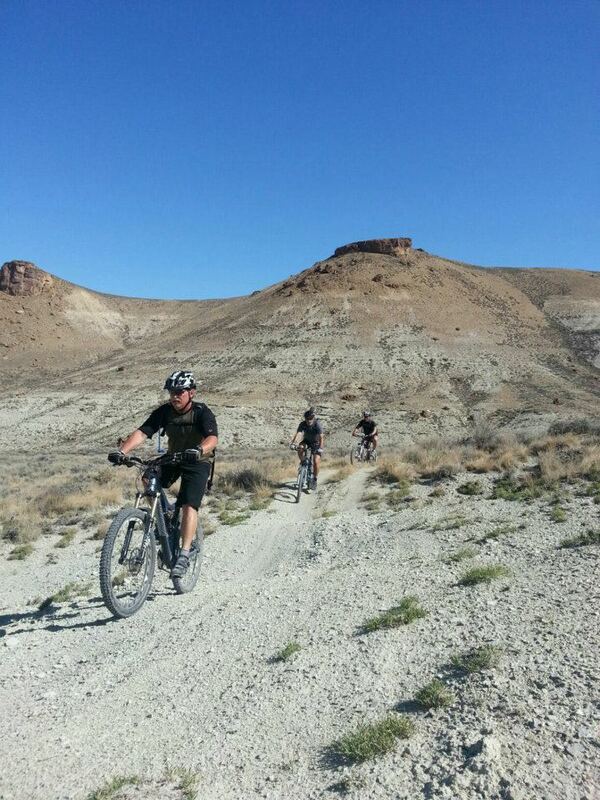 Bikers from the entire world travel to Green River to try the extensive mountain biking trails in the area. How do mountain bikers get there? They can drive by car on the high speed US Highway 86. It’s about 2 hours from Salt Lake City. Or, they can take the train. These days, the train doesn’t stop in Green River, but it stops in nearby Rawlins, Wyoming. It stops at the bus station. Such is progress.